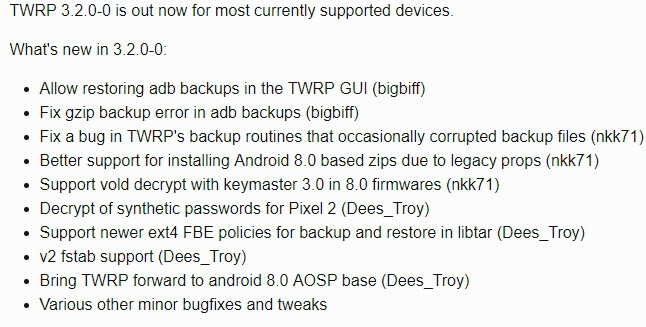 TWRP recovery 3.2.3-0 and version 3.2.2-0 release is now rolling out with some stunning new features and support for a lot of Android devices. The new update brings support for Google Pixel 2 and Pixel 2 XL devices. According to the changelog, the TWRP 3.2 is focused on the stability for Android 8.0 Oreo based devices. Now that the official Oreo is out, we will see many Android 8.0 based custom ROMS like AOSP 8.0 ports, Lineage OS 15, Resurrection Remix 6.0, Paranoid Android 8.0, and much more. So the latest TWRP version will come in handy. TWRP recovery v3.2+ now allows restoring ADB backups from within the TWRP GUI. TWRP has now fixed the corrupted data in backup files. The most important update comes to a better support for flashing Android 8.0 Oreo ROMS. There are various other Oreo related changes and stability improvements. You can check them out from below. How to install latest official TWRP on any Android device? If you have Samsung device, then head over to this tutorial.